In 2018 my husband and I decided that we wanted to spend our fall season as Amazonians. We figured it would be good money, and it fits perfectly with our current workamping schedule. 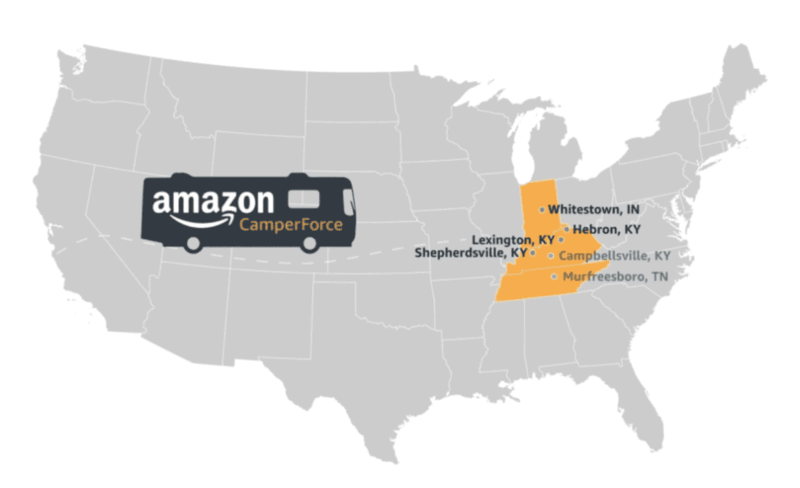 There’s not a ton of info out there on the Camperforce program, let alone working at Amazon when you have a family in tow, so I’m excited to share our experience and even inspire others to take advantage of this awesome money making opportunity. It worked well for our family, and maybe it could work for you too! For our kids…it was just another ten weeks of Mom and Dad’s shenanigans that they were forced to go along with. Our Experience: We signed up for the Hebron, KY facility. Our campground, Little Farm on the River, was great! Large sites, clean facilities, Wifi was just OK, AT&T phone service was very limited, but most of all the campground was safe and felt comfortable. This was extremely important to us because we have kiddos in tow. The commute was easy, about 30 minutes one way, which seems about standard for most facilities. We also had plenty of grocery stores, gas stations, and Walmart close by. We were right on the Ohio River, and Cincinnati was within a 40-minute drive, so there is plenty to see and do in the surrounding areas. We were assigned to CVG1 which deals mostly with apparel. Having not worked at Amazon before I would not have even thought to consider the material that the facility processes but this seemed easier than dealing with appliances, food, etc. In years past Amazon has offered a seasonal schedule that runs from approximately late August to just before Christmas, typically the season ends December 23rd, with some flexibility on either end. This year they rolled out Peak Returns which extends the Camperforce season until the end of March for those who choose to stay. So far the only facilities participating in the Peak Returns Camperforce program are Hebron, KY, and Lexington, KY. While most locations typically run September through December, certain locations in Kentucky (Hebron & Lexington) currently stay open months later for returns. Would we do it again? …yes. Our Experience: We arrived at the campground in mid-October. Amazon pays for your site up to two nights on the front end and two nights on the back end. The weather was mild until mid-November, we did freeze up one time, but we adjusted our heat tape, filter, and regulator and we did fine for the remainder of our season which ended December 22nd. We did have the option to continue with Peak Returns, but we opted not to. Keep in mind Peak Returns is located at a different building, which means a new shift, new department, new managers, etc. This information was made available to associates about two weeks before the end of their current assignment. $15.00 / hour base rate. Overtime paid at $22.50 for anything over 40 hours. Seasonal Bonus paid at $1.00 for every regular hour worked and $1.50 for every overtime hour worked. 5 hours of Paid Time Off. If you take this time it will not affect your bonus. We took home $6000 each for the season, plus no lodging fees. Our Experience: Overall we were offered several overtime opportunities. While they did offer VTO (Voluntary Time Off) quite often, you are not required to take it. They did, however, cancel 2 MET (Mandatory Extra Time) days, and didn’t schedule us for one of our overtime days. So that’s lost money, but I feel like our take-home pay was about what I anticipated. As of 2018, Amazon can only require Camperforce associates to work a maximum of 50 hours per week and overtime hours can only be on your scheduled overtime day. Camperforce associates do not qualify for holiday pay. Also, while Amazon cannot force you to work more than 50 hours per week, if the overtime is available you can sign up for an extra overtime day at 9 hours to get you to a maximum of 59 hours per week. We each took home $6000 for our entire season, plus we did not incur any lodging fees from October 13 through December 25. What will I do at Amazon? Receiving – The receiver’s job is to receive product into the inventory system and place it on a cart so that it may be placed onto shelves. Our Experience: When we arrived for our new hire orientation we found out that we were going to be pickers. Primarily as a picker, it’s your job to pull items from the bins and fill your totes. Every morning you will participate in “Standup,” approximately 5 minutes to stretch and listen to announcements. After standup, the group scatters and goes about their assigned tasks. Once you are ready to work, you activate your scanner, and it tells you exactly where to go in the fulfillment center. Once you are in the correct area, you grab a cart full of totes and head to the area on your scanner. The scanner will NOT let you mess up. Scan the bin, scan the item, place tote on the conveyor, rinse and repeat. In a nutshell that’s what you do for 10 hours a day, five days a week. Physically it was demanding. We averaged about 7 miles per day of walking. Moreover the repetitive motions, bending, crouching, leaning, scanning, all became increasingly challenging, you start to notice how these movements take a toll on your body. Mentally this was the hardest part. The work is easy if not mind-numbing, and I found it difficult to be alone with my thoughts for 10 hours a day. The job of a picker requires very little thought, so I was desperate to occupy my mind. There were however plenty of associates who liked the work, and of course, anyone can do anything for ten weeks, especially at $15 an hour. As the weeks went on we also received training in ICQA and Gift Wrap, although this was not the case with every associate, and our time in those departments was limited, our primary position was in picking. What about Amazon with kids? If you’re like me, you always have high hopes of finding your new RV besties when you pull into a new campground, but in our experience, we found no Camperforce associates with kiddos in tow. Not a deal breaker but this may not be the utopia you dreamed about en route to the facility. You can absolutely participate in the Camperforce program when you have children at home, but you really have to make sure it’s a good fit for your family. Consider things like school, meals, exercise, shopping, and just the overall hours in the day that your children will be “fending for themselves.” Keep in mind you’ll be quite tired when you come home, so having children who are able to pitch in with chores and keep the household going will be very beneficial. Overall with the right family, I think this can be an excellent exercise in independence. Our Experience: This is the first time that our kiddos haven’t had either mom or dad the majority of the day. 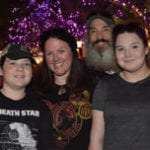 They are 14 and 12 and just about the best kiddos you could ever ask for. We decided as a family that this is what we all wanted to do, so off we went. We discussed the possibilities of Hubby and I both working nights and decided that we would not put our family in that situation. If for some reason we both got put on nights one of us would just bow out and find a gig at Target or something, they pay $12.00 minimum, and we would still get our campsite, etc.. paid for with only one of us working Amazon. Fortunately, we both got put on days. I do feel like this was the best scenario for our family. If we had worked opposite shifts, Hubby and I would almost never see each other. This just wouldn’t work for our couple dynamic. That is one aspect I don’t like about Amazon, you won’t know your shift until you get there, and that’s kind of a burden when you have kiddos. Although, I feel like the facility was very accommodating to all of our Camperforce team, and I have high hopes that they would work with you to find something that works for everyone. I am so proud to report that no one was injured, the house is still standing, and the kiddos didn’t kill each other. I do not think this is for children who are not uber responsible. They are forced to handle the daily grind, school, chores, etc. — all while in a strange place, without Mom and Dad, to keep them company. Now for our kids, this just kind of is. It’s no hostel in the middle of Honduras that’s for sure! So to them, I think it was just another ten weeks of Mom and Dad’s shenanigans that they were forced to go along with. And that’s why they are going to be absolutely awesome adults!! They did start to wear down over the last couple of weeks, I think we all did, but they pushed through, and I think they feel a sense of accomplishment. Again, this is not for the children who push boundaries and make you worry. It’s probably not right for your family if you have little ones or kids who need their time micromanaged. But if you have kiddos that can stick to a schedule, take pride in doing a good job, and get their work done, then I highly recommend it. More than likely yes. I can’t reiterate enough how good the money is. You will not find winter work that pays quite like Amazon, especially after that significant bump to $15/hour. We both agree that it would be easier now that we know what to expect. So would the kids do it again? Hours Available – This is one thing that concerns me with CVG1 in particular. All we kept hearing is that year after year at this facility peak was getting smaller and smaller. And there was quite a bit of VTO (Voluntary Time Off). So I’m not even sure this facility will be around next season due to the lack of work. This is not something that can be predicted, but I would hope that they would only offer Camperforce in areas that will still provide plenty of OT, as that is where the money is. Weather – It seems like every Camperforce facility is in a cold weather climate. With a little preparation, you can get your RV to a state that will withstand the cold…to an extent! I feel like the weather is changing all over the place, and it’s just getting colder. But really the only facility that’s available right now that would be any better would most likely be Murfreesboro, TN. And even there it can still get quite cold. So until they set up Camperforce in the middle of Costa Rica, I think it’s a crap shoot. Campground – This probably plays in a little more when you have kids. I really liked our campground. I felt safe. The kids felt safe. And the facilities were clean and maintained. There were no problems with the water freezing up, and the electric was OK. I cannot speak to the campgrounds in Murfreesboro, TN, but they did not appear nearly as nice or convenient for the commute. I do feel like the Camperforce program as a whole could use some improvement. There is a severe lack of communication. And with a few minor changes, I think they could really offer an outstanding program. It does appear, based on conversations and correspondence, that they are trying to grow the program. Of course, I had my own lengthy email that I sent off with some alterations that would make the experience so much smoother. All in all, I value the Camperforce program tremendously. Without it, winter work–at least for us–would be very difficult to find due to our current obligations. I highly recommend doing a season, even if just out of curiosity. We met some good people. And it felt good to see through a commitment. And too, I am all about gaining perspective. It might not have been a seedy city in some Central American country, but it sure taught me a lot.